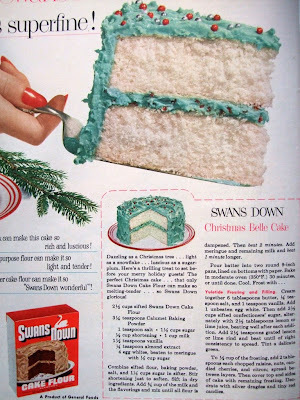 Maybe this Christmas Belle cake is not so bad - I just take issue with the silver dragees on top. Those things will break your teeth, not to mention their labels usually say, "for decoration only" indicating that they may be toxic. 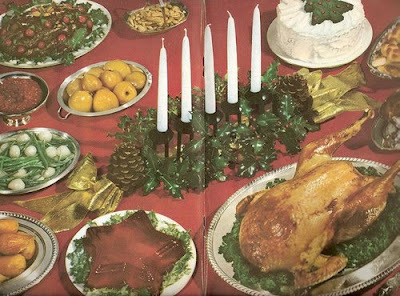 But, what didn't we eat in the 50s-80s that wasn't? This eggnog looks more like dip! 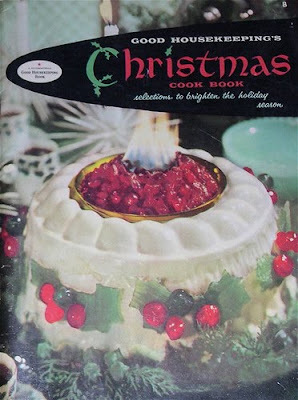 Nothing like good old fashioned artery-clogging melted fat to make that holiday pie taste better. 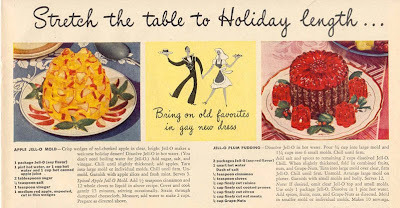 It wouldn't be the holidays without unappetizing bits of food suspended in Jello. As a bonus, we're treated to a personal wartime message from Kate Smith (you know it's personal because she's addressing us as "folks")...along with a plug to buy her book. 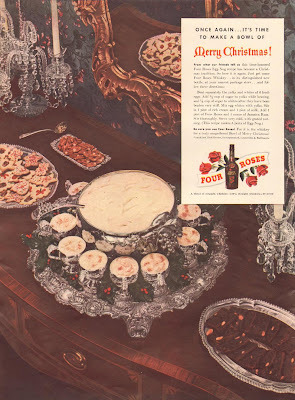 It's hard to see, but there's a recipe for some sort of Christmas tree salad at the bottom of this Carnation ad. 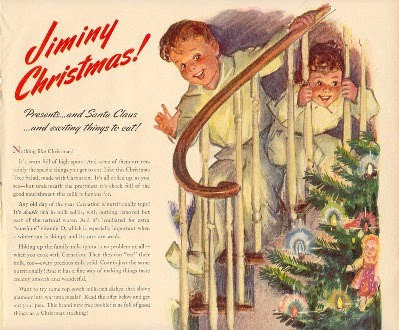 I'm sure that's exactly why these little boys are so excited about as they rush down the stairs on Christmas morning...right. Sure, I'll make it a fruit juice Xmas with one of these...and plenty of vodka, please. 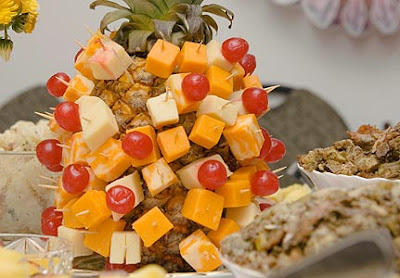 Following the pineapple theme, some kind creative 70s soul thought that if you stuck cheese and maraschino cherries in one, hey, it looks just like a Christmas tree! Wow, a flaming dessert wreath as a centerpiece for your table. Try to top that one, Martha Stewart. Yes yes yes, I like your blog!!! You know, silver dragees are banned in California! What worries me is that I used to eat them when I were a lad. Seriously: I'd crunch into them and everything! This is another truly wonderful post of yours. That first cake has to be one of the most revolting things I've ever seen! 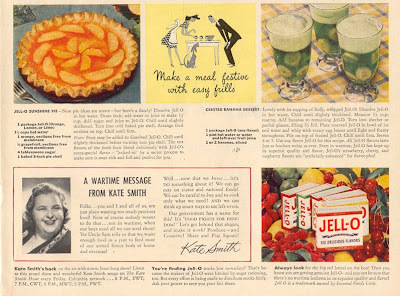 Have you noticed that every recipe from the 60's and 70's involves gelatin? 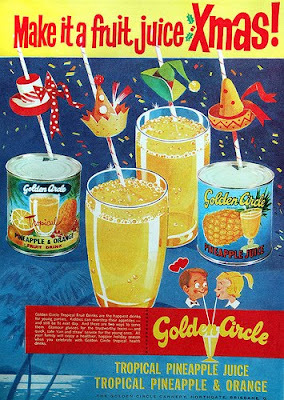 They put everything imaginable in a couple packets of Knox gelatin, added a few drops of red dye #5 and called it good. Think I'll do a post on this. I'm enjoying your blog. Yikes I used to eat those silver balls as well. And YES! 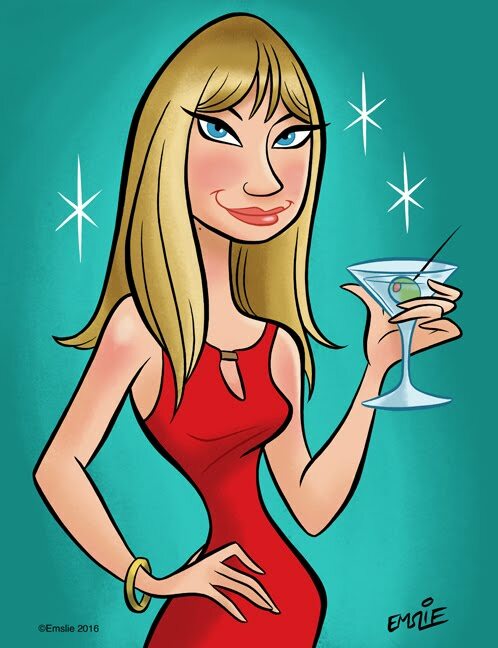 I WILL have a fruit juice Xmas if it looks like that! Hmmm I think I might actually try that pineapple thing - don't judge me! Hey, I did try the pineapple thing after all!